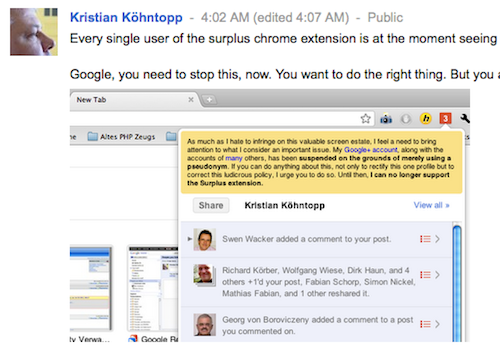 A 16-year-old developer who created a Chrome browser extension for Google+ called Surplus will no longer support the extension because Google suspended his personal Google+ account for using a pseudonym. Antimatter15 reported his suspension on the Chrome Web Store page for Surplus, which allows people to switch between multiple Google accounts, post or respond from within a popup and receive desktop notifications and use notification sounds. The developer wrote on the Surplus page, "If you can do anything about this, not only to rectify this one profile but to correct this ludicrous policy, I urge you to do so. Until then, I can no longer support the Surplus extension." On his personal blog, Antimatter15 questions the logic of social networks demanding that people use their real names, asking, "What if your 'real name' isn’t what you’re known as? What if you don’t feel comfortable revealing this information?" Reaction to Antimatter15's suspension has been mixed. Those on his blog have been supportive while those on the Surplus page have been either supportive or said he whines too much, needs to grow up, etc. Kristian Köhntopp was among the first to say Google's policy in this matter was wrong (see his post). Antimatter15 on Twitter and Github.